Hello and welcome to "Whiteboard Wednesday." Today, I'm going to be talking about how you can break down some of the buzzwords which law firms use in their promotional material. Okay. 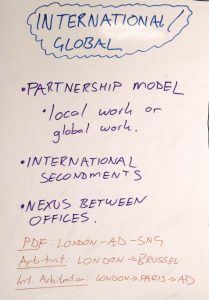 Starting off with probably the most used law firm buzzword which you'll find in graduate recruitment material - international, global, something like that. Now, with all of these, none of them are actually untrue. They're all true. But the issue is how you begin to understand the law firm and how it differs from different law firms based on some quite generic terms. So let's deal with the first one - international global. I just want to give you some tips in this video on how you might be able to break these down. So, first of all, look at something like the partnership model. Is it a global partnership? Is it a Swiss Verein? And we've done another Whiteboard Wednesday on this topic for avid viewers of Whiteboard Wednesday, if there is such a thing! But partnership models is one thing. A key thing to look out for is when you see a law firm with many, many different international offices, is are they actually doing global work? So, cross-jurisdictional cross-border activity, or are those individual offices dealing with local work within that particular jurisdiction? And that's one of the big things that you can look out for. You might see a law firm with 10 international offices as opposed to a law firm with 50 international offices but the work at the firm that has 10 international offices might actually be a bit more global by nature because it's involved in cross-border work. Also from a trainee's perspective, look at international secondments. You’ll be looking at it from the point of view of, "I'd like to spend six months in that country," in most instances - but where law firms send trainees on secondment will usually give you an idea of where their key practice areas are and where other key offices are doing UK work. So international secondments is definitely something to look out for to understand which are the big offices within a particular network. But the other thing I think people should look out for as well is the nexus between offices. Even though a law firm might have 50 offices, not all of the lawyers will be working with the other lawyers in all of those offices. 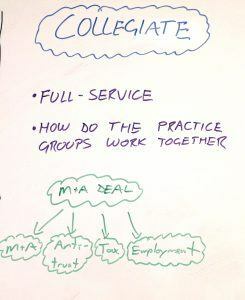 Even for the ones who are dealing with cross-border global work, individual practice groups tend to work closely together and there's definitely a link between certain offices. So just to give you an example here at Shearman, a project development finance team (PDF), they work really closely across the London office, the Abu Dhabi office, and the Singapore office. It's not to say they are the only offices that the PDF team work with but that's a core link. Antitrust – there’s a big link between London and Brussels. For international arbitration, there's a big link between London, Paris, Abu Dhabi. Other practice groups like capital markets - the big link is between New York and London. So if you're interested in a particular practice group, try and understand the key offices within a network for that practice group. Okay. So that's the first one. Let's have a look at the second one, ‘Collegiate’. Law firms really have to be collegiate. Lawyers have to be able to work together. One of the first things you can look up is whether the law firm is full service. That means they'll have many different practice areas and the reason that that's important is that the practice groups will work together when it comes to winning work and working on particular deals. So being a full service law firm means that you might be working on an M&A deal - but it's not just the M&A team that will be involved. You obviously will have the M&A team but there might be elements of anti-trust in there, there might be elements of tax, there might be elements of employment. So actually, the lawyers in all of those particular practice groups will work together, will need to work together to be able to win the work. So that's one way of looking at collegiate work. But you will find that most lawyers have to be collegiate, will have to be able to work together, particularly in international and global firms. 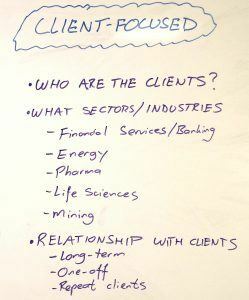 The other one that I'm going to focus on is ‘client-focused’. Now, this is quite a vacuous term because lawyers obviously have to be client-focused because that's where the money comes from. If you don't have any clients, you don't have any money, right? So, first of all, think about who the clients are. Every law firm will appeal to different clients. Some shared clients but not always. So try and think - who the main clients are for each law firm that you're interested in. Then, you can look at what sectors and industries that these clients are based in. So when you initially look at law firms, you're thinking about practice groups, you're thinking about finance, antitrust, M&A, that type of work. Clients don't structure themselves like that. Clients will, for example, be based in the financial services sector or the energy sector, pharmaceuticals, life sciences, mining. Etc. But what law firms try and do is appeal to clients in a particular sector by becoming experts in that sector. When we talk about lawyers having commercial awareness, it's often because you have lawyers who might be specialists in project development and finance but they are also experts in the energy sector or the mining sector for example. When you look at practice groups and industries - law firms often have an industry focus. That's where things begin to maybe make more sense, rather than these generic terms. The other thing you should look at as well is the relationship with clients because law firms do different types of work. So just think about, "Are the relationships with clients long-term?" With the law firms that you're interested in, do they have the long-term clients? Or, by the nature of the work, do they work with clients on an individual basis. So, essentially, work with many, many different clients. Or do they work with the clients on a repeat business basis? This all depends on the type of work that they do. Well, those are just some tips in terms of how to break this down. I think that there are many law firm buzzwords out there but those are the main three that you'll find. But if you begin to break it down and look at things in this way, you might get a better picture of what a law firm actually specializes in. So hope you find that useful and if you've got any questions, just type them below. We'll see you next time on Whiteboard Wednesday. Thank you. See all Whiteboard Wednesday Videos.